Plants that release color in a hot water bath are the easiest to use for dyeing, giving beginners good results with their the first attempt. Most plants require simple chopping and boiling to make dye. Grow some dye plants in the garden, and take advantage of some wild dye plants as well. 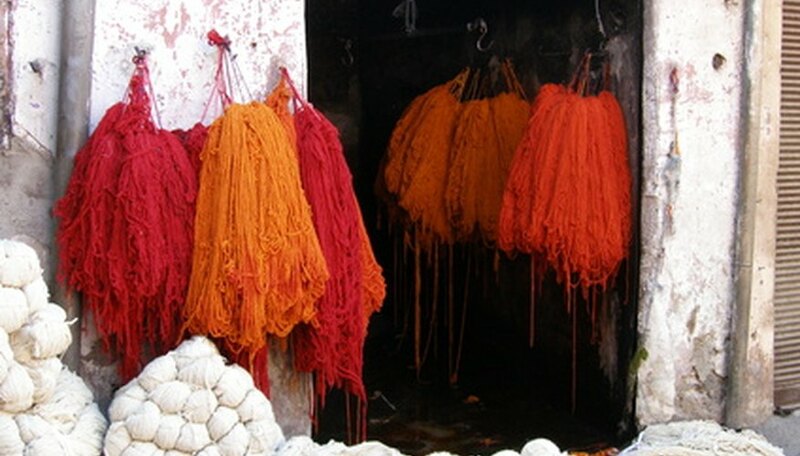 Different natural fibers (cotton, wool, linen or silk) will react differently with different dyes, so experiment with an assortment of plants and fibers. Marigold flowers produce bright shades of yellow. Dried onion skins from yellow onions also produce yellow dye. St. John’s wort flowers and leaves, dandelion flowers and goldenrod flowers will give bright yellow color. Daffodil flowers can be used after they have dried to make yellow dye, using alum as a mordant. A mordant is a metallic additive such as alum or iron that reacts with the dye color on the fibers to alter shades and intensity. Used with alum mordant, dark purple iris petals and blue bachelor’s button (cornflower) blossoms will make blue dye. Blue hyacinth flowers create a clear blue color. For purplish blue, use fruits of black raspberries or purple grapes. Mulberries will give a royal purple dye, and elderberries give lighter lavender shades. Dandelion root can be chopped and boiled to make reddish-brown dye. Sumac berries make light red, as do rose hips or dried hibiscus flowers. Beets make lovely bright magenta dye. Soak the entire plant of St. John’s wort in alcohol to make red dye. Boiled crab apple bark yields dye in a range from yellow to red, depending on the tree. Pokeweed berries make magenta-red dye. Old flower heads from daylilies give a nice red-orange color. The outer nut husks of butternuts make orange dye when they are boiled. Carrot roots, bloodroot and some lichens also make orange. Sassafras leavesproduce a nice golden orange when they are chopped and boiled. Lilac twigs also give a range of yellow to orange, depending on the shrub. True black dye is difficult to achieve. Oak gall is the best source for black. Oak gall dye was also used as ink. Several species of artemesia plants yield good green color by chopping and boiling the entire plants. Green dye can also be made from spinach leaves, red pine needles, lilac flowers, and snapdragon flowers. Purple milkweed flowers and leaves as well as red onion skins also make green dye. Boiled black walnut shells make an intense deep brown dye. Oak bark as well as boiled acorns will make light brown dye. Tea bags and coffee grounds are a good source for brown. Juniper berries, white birch bark and ivy twigs yield light tan or yellowish-brown. What Flowers Are Poisonous to Cats?